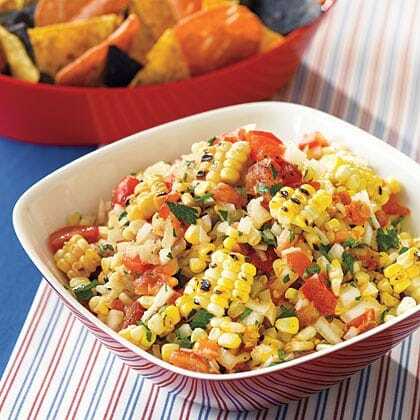 This year, don’t be the one who puts out that crappy, jarred salsa at your Super Bowl Party….instead, try this quick and easy Roasted Corn Salsa Recipe. It’s colorful, amazingly flavorful, and definitely a change of pace. Granted, corn is the base for this salsa, so it will have some calories and carbs, but for just 4 Points, you get a HUGE, heaping, full cup serving! Sometimes, I just forgo the chips and eat this by itself as a side salad. My husband LOVES it. It’s so easy to make, and it’s so much more flavorful and impressive than typical salsas. This is one more WW Super Bowl Recipe that should make it to your table this year! We tried this recipe for the Super Bowl & it was fantastic! Even my son that isn't a huge fan of corn loved it! I thought it looked like a huge amount, but it was all quickly devoured. Everyone commented on how great it tasted.